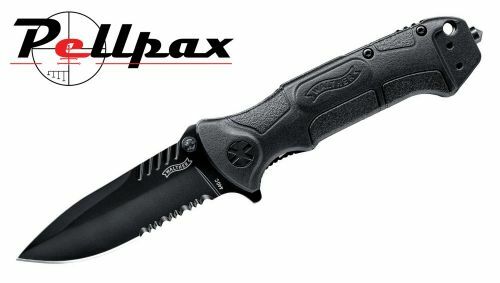 The Black Tac 2 knife from Walther is an excellent one handed opening knife, complete with a liner lock and a flipper for fast and precise opening. The blade is made from Stainless Steel and is crafted into a spear point shape with a razor sharp edge. A partial serration section permits excellent sawing capability when it is required, and the stainless steel prevents rusting. The handle is made from synthetic polymer with a new improved feel, and a glass breaker is incorporated into the end of the handle. A holster is included to keep it safe at all times. Add this item to your basket & spend an extra £464.01 to apply for finance.